When the comic book industry releases its upcoming solicitations (two months in advance), there's always a lot of buzz and fanfare over the announcements for the four "front of the book" publishers: Dark Horse, DC, Image, and Marvel. The thing is, some of the most exciting books due to hit are actually the ones from the other publishers. This, then, is the first in a series of monthly rundowns of the other books you should be talking about, the big books you might have missed. Trust me, if you've never checked some of these other creators or series out, you've seriously been missing out. When war comes, it doesn't just change your food, your clothes, and your home. It changes your beliefs, your dreams, and your understanding of the world. Swept up in a war he never thought would happen, Giuliano begins to question what he's fighting for - if he's even fighting for anything. Written and illustrated by Italian graphic novelist Gipi, Notes for a War Story is an honest and important graphic novel about the consequences of war. Winner of the "Best Book" prize at Angouleme in 2005. Gipi's They Found the Car and The Innocents quickly taught me that this is a creator whose works you should absolutely track down if they're translated into English. Both of the other books were a great sort of film noir (well, they weren't films but you know what I mean), atmospheric and dark and mysterious. Gipi tackling war in his lush watercolor-painted art? I can almost guarantee that it's going to be exciting and thought-provoking. Add in that it won the Best Book prize at Angouleme (a comics convention in France so big it literally takes over the entire town) and you just know, this is good stuff. "The Debt" (Part One): With the whereabouts of his last paycheck still unknown, the Killer has to shelve his plans for some peace and quiet, and new clients are knocking at the door. There's no passing up a serious job right now, and no time to be choosy about clientele. In fact, his new client isn't giving him a choice, and there's a chance he knows something the Killer wants: the answer to what went wrong in Paris. The stakes are rising, but the Killer's ready to play the game: keeping his head and putting holes in everyone else's. The Killer is a translation of a best-selling French graphic novel series about a nameless assassin whose (admittedly twisted) life is slowly falling apart. He's the sort of character who you can't stop reading about because he's fascinating, but the further you delve into his psyche, the more you understand what a sociopath he truly is. There's a collection of the first four issues hitting stores this month, and I love this series. One of the creepier books out there, and that's a compliment. The Foundation has now revealed itself to one unlikely man and recruited him into their ranks. Using the lost texts of Nostradamus, the knowledge of the future is theirs. But it's subject to interpretation. Will they read the text correctly, or make a crucial mistake? A vibrant new thriller with the action of 24 but using the tone of X-Files! I've never heard of this book (I don't think the first issue is out just yet) but John Rozum is an amazing writer. His series Xombi for Milestone Media is one of the great, forgotten, uncollected series from the past couple of decades, balancing strange and warped ideas with a real sense of humanity. Likewise, his Midnight, Mass for Vertigo was a beautiful mix of the Nick & Nora Thin Man movies and the occult, with the hidden world of the supernatural erupting into our society. So between the description of Foundation and the fact that Rozum is writing it? Sold. Shuro is a superhuman with awesome mental powers. Isaac is his clone who shares his abilities but adds to them a hatred of humanity. Now it's up to Shuro to stop his sibling before the world is destroyed. ES (short for Eternal Sabbath) is one of those series where every time I read the next volume, I wonder why we haven't seen a $50 million movie adaptation. Psychic powers, clones, genetic mutations, hatred of humanity, and an uncertain relationship between our potential superhuman savior and the human scientist who is trying to stop Isaac? I'm seeing a box office bonanza. Someone call the Wachowski Brothers. 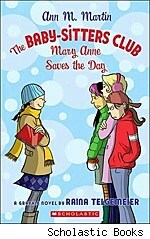 When a terrible fight breaks out among the four Baby-Sitters Club friends, Mary Anne is left to her own devices. She has to sit by herself at lunch, make new friends, and deal with her overprotective father without advice from the BSC gang. But the worst part is when she faces a terrible baby-sitting predicament, and she can't find any help. Luckily, Mary Anne rises to the occasion. Not only does she handle all her problems with aplomb, she also manages to get the BSC back together again. What? What? I love, love, love Raina Telgemeier's adaptations of the Baby-Sitters Club books. They're fun, they're cute, they're even a little suspenseful (even though you know that in the end all the problems will be solved). Don't be a hater and assume that these are just for little kids. Telgemeier's clean art style is gorgeous (check out her web-comic Smile for an example of how great she is) and these are just a joy to read. Coming tomorrow... five more books you know you're dying to read!